Nilagiri is a town and a notified area committee in Balasore district in the Indian state of Odisha. 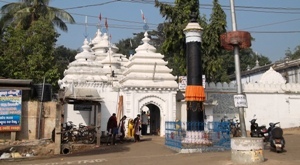 This is the fourth popular Jagannatha temple of Odisha after Puri, the ‘Shabara Shreekshetra’ in Koraput and the Baripada Jagannatha temple. Jagannatha along with his elder brother Balabhadra and younger sister Subhadra are worshipped in the main temple. The temple was built by a king of the Harichandan dynasty of Nilagiri. For many years the temple was being managed by the descendants of the royal Harichandan dynasty, but since the abolishment of the royal families the temple has been handed over to an independent trust that manages the running of the temple. Situated in the foothills of Swarnachuda hills, the Jagannatha temple remains cool even during summer. There are many small temples for deities like Vimala, Ganesha and Shiva in the temple premises.